Designed by Rieche, Carter & Smith and built by Jeffery and Mary Keating in 1891, the former Keating House is one of the last vintage homes built before the silver crash of 1893. Keating, a real estate investor and founder of McPhee & McGinnity Lumber Company, accumulated his wealth with the early expansion of Denver. In a neighborhood predominated by people of wealth and power such as Molly Brown, Boettcher, Cheesman, Keating, and Moffat, there were many finely crafted mansions. Today, the former Keating House remains a landmark of Colorado's Victorian era with its period architecture and outstanding craftsmanship. The home remained a family mansion until 1923 when it became the Buena Vista Hotel, named for its "beautiful view" of Colorado's majestic mountains. 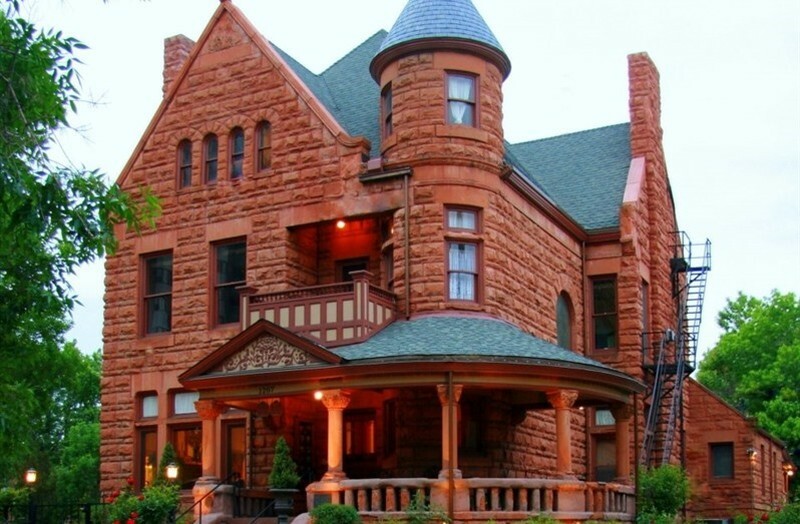 Recently, the home was returned to its former majesty with its conversion to the Capitol Hill Mansion, one of Denver's newest and most luxurious Bed & Breakfast Inns. The home at 1207 Pennsylvania Street sits on some of Denver's most historic ground. It was platted over a century ago, part of Porter's Addition to Denver, when the land east of Broadway was prairie. The lots - 15 through 17, block 79 - changed hands several times through the years before the home itself was built. The land's owners included some of Denver's most illustrious men, none as important as Porter, the man who developed the addition. Henry Porter, telegraph builder, merchant, and entrepreneur, incorporated his addition in the late 1860's. At one time, most of Pennsylvania Street and Logan (then named Kansas) Street belonged to Porter from Colfax to Sixth Avenue. The heart of the property was the barren crest of Capitol Hill. Porter, one of Denver's giants, was born in Lancaster, Pennsylvania in 1838, but grew up on farms near Adair and Jefferson City, Missouri. Due to a lack of educational opportunities, Porter ignored formal schooling. Instead, he joined the Missouri Telegraph Company at the age of 18 and worked on construction gangs for the Overland Telegraph Company building lines from St.Louis to Omaha to Julesburg on the Colorado frontier. Later, he spent a brief period in gold country, opening a store that quickly failed. In 1861 he left Colorado for the Civil War where he was responsible for keeping Union telegraph lines open throughout Missouri and Arkansas. Within a year, he was captured by Confederate troops and spent the remainder of the war in prison camps in Mississippi. After the war, Porter returned to Missouri and formed a telegraph company with Charles M. Stebbins, a veteran of the telegraph building. Together, they came to Denver and formed the Porter and Stebbins Telegraph Company, building lines north to Cheyenne and south to Santa Fe. Later, the two also established the Porter and Stebbins Grocery Company as well. Within a few years, Stebbins went his own way (eventually dying insane). Porter remained in Denver, concentrating on the grocery business, which gradually expanded into a commission, and banking business into New Mexico and Kansas. By the end of the century, Porter had added real estate and stock rising to his interests - his cattle empire alone ranged as far south as Texas and his real estate holdings extended from Del Norte, Colorado to southern New Mexico. Nothing, however, matched his small empire on Capitol Hill. Over the years, it alone profited him over a million dollars. Long after his land was sold and developed, Porter remained a major business and civic figure. He was one of Denver's major brokers (in partnership with the legendary Claude Boettcher) and he was actively connected to the Colorado Fuel and Iron Corporation, Denver Gas and Electric Company. He was also connected to the American Water Works Company, Denver Tramway Company, Mountain States Telephone Company, the Denver Union Stockyards, the Moffat Road, and both the Denver and American National Banks. Porter was always active in philanthropic affairs while in Denver and toward the end of his life created a fund over a million dollars for the building of the Porter Sanitarium in South Denver - one of the finest institutions of its kind in the world. Porter died in 1937, just short of his 100th birthday. Throughout the Porter years, other men owned the lots at 12th Avenue and Pennsylvania Street: Denver Mayor Marion Van Horn, abstractor Scott Anthony (whose company abstracted the property from its birth), entrepreneur Frederick Keener, Charles Stebbins, and business tycoon George Schleier. Schleir was a German who came to the United States at the age of six and to Denver in its infancy. Schleier was a cattleman, a banker, and general entrepreneur, accruing massive amounts of capital over the years. His mansion at 17th and Grant is his legacy. It was bought for $95, 000 in 1891, the same year another mansion - at 1207 Pennsylvania - was built. In the summer of 1891, after years of lying idle in Porter's addition, the lot at 12th Avenue and Pennsylvania Street finally got a home. On June 27th a building permit was issued for the construction of a 42-by-55 foot, two-story brick and stone home on lots 15-17. Its price was $8,000 (although the Denver Republican reported it at $10, 000 and the Rocky Mountain News $18, 000). The architects were C.M. Reiche, R.M. Carter, and C.A. Smith, who had an office together in the Bank Building at 17th and Arapahoe. The home's builder was insurance man, Jeffery Keating and his wife, Mary, who had prepared carefully for several years before building the home. In November 1890, Mrs. Keating secured lots 13 and 14 next door from Marion Van Horn for $6,100. On January 2, 1891, she paid $13,000 for lots 15, 16, and 17 and on January 22 she and Jeffery were given a three-year mortgage from Northwest Mutual Life Insurance Company - a $10, 000 loan at 6.5% interest. The magnificent Richardsonian Romanesque home built during the second half of 1891 became one of the major landmarks on Capitol Hill, but surprisingly little is known about the man who built it. Keating's business was primarily real estate, with ventures into insurance. Although the record is unclear, he was involved in the founding of the McPhee and McGinnity Lumber Company, Denver's largest for a generation. Beyond this, his activities are a mystery. He and Mary had a son, William J., who attended Carnegie Tech in Pittsburgh. Mary was the daughter of John Shevnin, another of Denver's early builders, who lived in the next block at 1361 Pennsylvania Street. Mary was a prominent young socialite and "ardent" charity worker, known for giving "luncheons of elegant appointments" (in the words of the News) at the home. She died in April, 1918, and was buried from the Immaculate Conception Cathedral. While in the Pennsylvania Street home, the Keatings entertained often and lived well, turning daily chores over to the servants and housekeepers (newspapers routinely carried an ad for them; "girl wanted for housework, family of three"). At least once, too, an exciting event happened at their home. One night in 1893 a shootout occurred in the alley behind the home when police cornered an apparent bandit; bullets were sprayed into the Keating home as well as into the home across the alley at 1208 Logan Street. Six years later, in April 1899, it happened again. Shots were exchanged between a policeman named Alvord and a man in "a dark suit, slouch hat and gray overcoat." According to the press, the man "saw Alvord's brass buttons and fired at him." Alvord returned the fire; the intruder "stumbled as though he was shot" and escaped through the Keating's yard. His neighbor at 1208 Logan Street was left with a bullet hole in the door - the same door the suspect had fired into in 1893. In 1900, the Keatings moved from the Pennsylvania Street home to 1600 York where they remained (and where Mrs. Keating died). For the next two years they rented 1207 Pennsylvania Street to Charles Bayly, a 30 year old Missourian and owner of the Underhill Manufacturing Company of Denver. Bayly was a native of St. Louis, born there in November 1870. At the age of 20 he moved west, to southwestern Colorado, where he operated a merchandising business until 1900. In that year, he moved to Denver, bought the Underhill Company, listed himself as a capitalist in the census of 1900 and moved to 1207 Pennsylvania. With him was his 30-year-old wife, Hester Mooney Bayly, born in Iowa in 1870. The Bayly's were married in Chicago in 1896 and had two children - Charles, 3, and Russell, 2 - when they moved into the home. In 1902, for a price of $30, 000, the Keatings sold the home to John W. Nesmith, an industrialist like Bayly (and, like Bayly, a man with a St.Louis background). In his field, Nesmith was one of the most powerful men in the west. Nesmith, from an old Scottish family dating back to the 13th century, was born in Chilllicothe, Ohio, on January 4, 1834. As a young man he moved to St. Louis, where he grew up. "Endowed with a strong proficiency for mechanics," according to a biographer, he quickly became a "mechanic of the first rank". As a young man, he moved to Central City in the spring of 1860 to build and manage a stamping mill owned by a St. Louis company. Later he moved to Denver and became connected with the A.G. Langford Iron Company; nine years later when the company was renamed the Colorado Iron Works and moved to Black Hawk, Nesmith moved with it. For two years, from 1868 to 1870, he also served in the territorial senate from Gilpin County. Briefly, in the 1870's, Nesmith moved into railroading applying his mechanic's skills to a totally new field. He began work as a master mechanic with the Denver division of the Kansas Pacific, and then moved to the superintendency of the Denver and South Park until February 1879. In that year, he made the biggest move of his life. Rejoining the Colorado Iron Works, he became its superintendent, then bought it and became its manager and president. When Nesmith bought the company it was small and struggling, but under him it grew to become one of most important manufacturers of mining goods in the United States. The company built most of the large smelters in the west, from Mexico to Montana, including a number of foreign countries. According to his biographers, Nesmith was almost totally responsible for the growth of his company; without his "sagacity, judicious management and knowledge and skill as an inventor, designer, and metallurgist" it would have achieved little. As Nesmith built his empire he became a powerful force in Denver. Not only were his family connections good (his brother Hubert, who served as his assistant superintendent, was the son-in-law of J.F. Brown, one of the premier capitalists in Colorado), but his professional alliances were as well. Driven downtown almost daily by his black coachman, William Gill, Nesmith dined at fine restaurants with the likes of Attorney Mitchell Benedict, merchant king George Gano, Judge Owen LeFevre, banking tycoon William Berger, and industrialist E.B. Hendrie of Hendrie and Bolthoff. Aside from Nesmith's wife, Elizabeth, who rarely shared the spotlight with him, his family was interesting. One daughter, Mrs. Eleanor (Finlay) McFarland, lived on a rambling coffee plantation 150 miles from Vera Cruz, Mexico for a number of years. In 1912, she married Milo W. Strong in Jersey City, New Jersey, and spent the rest of her life in Hendersonville, North Carolina. A second daughter, Isabel, married James Porter Evans, later vice president and general manager of the Iron Works. All of them were major figures in Denver society, both during and after their years at 1207 Pennsylvania. The Nesmiths lived at 1207 Pennsylvania until 1910. Elizabeth Nesmith lived in the Shirley Hotel for a year and died on September 25, 1910. The date of John Nesmith's death, surprisingly, is not certain. One thing, however, is certain: in all of its life, the home at 1207 Pennsylvania never had an owner quite like the old Scotsman. As one of his biographers has written, "Denver and Colorado have profited in large degree by his indomitable will and never-ceasing energy, and by the fame the products of his great achievements have given both… He has attained the success so justly due men possessing his sterling integrity and with a career so honorable as his." In the eyes of many of his contemporaries, Nesmith, a self-made, self-educated man, was one of America's leading authorities on chemistry, smelting, blast furnaces and civil engineering. Most would have agreed, as one wrote, "he has few, if any, superiors." Although the Nesmiths moved from 1207 Penn in 1909, the family maintained ownership of the home for many more years. On May 14, 1914, title passed to Isabel M. Evans and Eleanor Strong, Nesmith's daughters. They owned it together until 1923, but neither lived in the home. Eleanor Strong lived in North Carolina and Mrs. Evans lived at 1427 Franklin. Isabel Evans became one of Denver's most important women executives in Denver's early history. When her husband died - James Porter Evans, whom she had married in 1891 - she spent the rest of her years in Denver running the family business and meeting social commitments. She also became a world traveler. In 1936 she moved from Denver to Phoenix because of failing health; a year later, on a trip to San Francisco, she died of a heart attack. She left a daughter, Mrs. John Bane of 1029 8th Avenue. From 1910 to 1923 Mrs. Evans and Mrs. Strong, rented 1207 Pennsylvania to the Charles Loughridge family. In 1910 Mr. Loughridge, the family patriarch, moved into the home with his wife, Mel, a daughter and two sons. Charles Loughridge, born in Oscaloosa, Iowa, son of a prominent Iowa jurist and congressman, was a longtime Colorado mining promoter. Although trained in law (Yale, class of 1886) and the classics (he was a major Shakespearean scholar who spent his leisure time translating original Shakespearean works) , business was his game. Starting in Chicago and ending in Colorado, his biggest successes were in mining. In 1910 when he moved into the home, his primary business was the Kokomo Metals Company based near Leadville; in later years, he owned the prosperous Pennsylvania Mining Company out of Denver. His wife, from Chicago, was a prominent Denver social leader, active in all phases of charity and philanthropy. The two Loughridge boys, both born in Chicago before the family moved west, were among Denver's most important young men. William, 21 in 1910, graduated from Yale in 1912; three years later he earned a law degree from the University of Denver. In 1919, after service with the Signal Corps in World War I, the young second lieutenant resigned and joined the law firm of Lee, Loughridge, and Healy. In 1925 he launched his own practice and also served as president of his father's Pennsylvania Mining Company. Paul Loughridge was 18 when the family moved into the Penn Street home and 31 when he left. Following his brother, he received a BS degree from the Sheffield Scientific School at Yale in 1915. A big, rigged, blue-eyed young man, Loughridge threw the hammer "amazing distances" according to one account, and played tackle on the Bulldog football team. In 1916 he began a career in investments with the prestigious Sweet-Causey-Foster Company, only to be interrupted by the war. He served in France in 1917, entering the war as a captain and returning as a major and then as assistant chief of staff of the 26th division. He again returned to investments, joining the firm of his next door neighbor, Arthur Bosworth. In 1923 the Loughridges moved to 975 Pennsylvania, three blocks to the south and the rest of their lives were marked with tragedy. Charles Loughridge died suddenly in April 1928 of a paralytic stroke at age 70. His wife, Mel, broke a hip in 1932 and never recovered; she died in November 1933. Only a year later, on September 8, 1934, William Loughridge committed suicide at the age of 45, parking his car on Pence Road in Indian Hills near Kittredge, and asphyxiating himself. Police reports noted that he had inserted a fifteen foot section of hose in his car window, stuffed newly bought towels in the opening around it and placed a large rock on the gas pedal to keep the engine running. In death, his head and one arm lay over the back seat as if he were reaching for something. Bloodstains on his shirt indicated hemorrhaging before death. Police concluded that suicide was prompted by recent (undisclosed) illness and "extreme melancholia" over the death of his mother. Only Paul remained, but he became one of the major figures in Denver's financial circles over the next twenty years. In the 1920's, after the war, Arthur Bosworth, Octave Chanute and he formed the premier investment company in the Rockies. As a News reporter put it, they "came together as a triumvirate with destiny and they have shown this city something about selling bonds." Starting as a ten-hour-a-day clerk, Loughridge moved steadily upward until he became the driving force behind the company. "They believed in themselves and their work" said the paper "and they believed in their city. They had the confidence that wins." One good example was the company's decision to finance the struggling Colgate-Palmolive-Peet Company, later one of America's giants. Loughridge himself, with his strapping athletic build, his impeccable dress, his confidence, remained throughout his life a remarkable man with an unremarkable philosophy. "These are times, " he said, "when every man has to stick to his knitting. The man who loafs is sunk." In February 1923, a $20,000 warranty deed marked the transfer of 1207 Pennsylvania Street from Isabel Evans and Eleanor Strong to Buena Vista Crew, the wife of Denverite Frank E. Crew. The Crews moved into the home immediately, then in 1924 they converted it into the Buena Vista Hotel. The Crews themselves apparently left the residence, Bert B. Hull became its manager and the Crews moved to 1209 Penn (shortly after called the Seymour Apartments). Mrs. Crew became associated with the Grae-Rose Hat Shoppe. Josephine Russell, a widow, Victor and Minnie Novak and Mabelle Wilcoxen were all later proprietors of the Buena Vista, which apparently ceased operation in 1935. On March 24, 1933, the Crews sold 1207 Penn to Elvia and George H. Harvey, who owned it for the next five years. Harvey, who lived in north Denver, maintained the house as the Buena Vista through 1935, and then rented it for a year to salesman Clarence J. Walters. It was vacant in 1937. George Harvey was one of Denver's most prominent men in the 1930's, though hardly in the same sense as the Keatings, Nesmiths, and Loughridges before him. He was born in Mason City, Iowa, on March 7, 1876, and moved to Denver at the age of four. George M. Harvey, Sr., his father, began a liquor and cigar business in the city before founding the Harvey Glove Company in 1904. George Jr. graduated from North High School, then Grinnell (Iowa) College in 1896. Returning to Denver, he sold leather goods on his own, then merged with his father. When George Sr. died in 1928, George Jr. ran the business until 1941 when he closed it and retired. Throughout his life, Harvey was most famous not for his business skills but for his music. For over fifty years he was the most noted cellist in Denver and one of its most respected orchestral conductors. At different times in his life he conducted the Boulevard Orchestra - Denver's first Symphony - and played first cello both under the famed Rafaello Cavallo in the Symphony Association (1903) and in the later Denver Civic Symphony. He was also a longtime member of the Denver Symphony Orchestra's board of directors. He shared his music with everyone for as many years as he could, in as many ways as he could. In one memorable month during World War II he and several friends pooled gas rationing coupons, raised money with them and brought 2000 soldiers from nearby military bases to his home for evenings of dining and listening to classical records. His esthetic sense, however, also went beyond music. He was president of the Colorado Mountain Club for a few years and president of the Mountain Parks Association as well. Reputedly, he was one of the finest amateur photographers in Colorado. One of his last major gestures was the donation of his Buffalo Park summer home to a Denver social agency for the use and enjoyment of the poor. George Harvey died in August 1960 from a fall and surgical complications, at the age of 84. He left behind an estate worth more than $300,000. The Harveys sold 1207 Pennsylvania on April 13, 1938 to James Homer Weatherly and his wife, Fay. Weatherly was a salesman; he and his wife lived in the "Molly Brown House" at 1340 Pennsylvania, just across the street from the old home of Mary Shevnin Keating. They owned 1207 Penn until May 1, 1944. Under their ownership the old home underwent a transformation: in 1939 it became a convalescent home, and so it stayed until 1942. The Weatherlys leased the home to three people - Henry H. Austin, and William E. and Ophelia Harrelson. Part of the home apparently was used for business: in 1938 the Austin Milling Corporation (with Austin as it's president) was listed at this address. In 1939 it was listed as the Austin and Harrelson Convalescent Home and in 1940 and 1941 as the Happy Home Convalescent Home run by Ophelia Harrelson. In 1942, under the management of Mrs. Mary McDonald (who lived here with her husband Ralph) it became the McDonald Convalescent Home. In 1944 Ophelia Harrelson bought the property from the Weatherlys: she and her husband - by then a prosperous oilman - lived elsewhere and continued to lease the home. In 1945, 1207 Penn became the Fuller House Apartments, run by Mrs. Ruth B. Fuller and her husband, William H., an accountant. Besides rooms for themselves, the Fullers rented four other units. In 1947 Mrs. Bessie L. Farr, from Berwyn, Illinois, was brought in to manage the apartments (she came from a block away: she had run Farr's Guest House in the old mansion at 1129 Penn for two years). On July 15, 1949, Mrs. Farr and a friend, Mabel Hill bought 1207 Pennsylvania from the Harrelsons for $35, 000. Two years later they sold it to Effie Willhite, who renamed it Willhite Guest Home (although it also lodged the offices of attorney Merrit D. Fondy and the International Foundation for Nurses). In 1954, after apparent renovation (the record here is unclear), 1207 became the Holly Apartments under the supervision of Roscoe and Jeanette Holabird who lived in Mayfair at 800 Hudson (and later in the foothills of Denver). The Keating House remained the Holly Apartments into the 1960's. At that time, it was completely converted into office space, as it was when purchased for conversion into the Capitol Hill Mansion, seven bathrooms were either added or upgraded and a complete kitchen was installed (none existed in the house in 1993 except the current kitchen in the Elk Thistle suite on the third floor). Other changes, such as removing relatively new walls, which cut off the second floor, opening up the rear staircase between the first and second floors, and closing and/or moving doorways (most of which were relatively newly constructed), brought the home back to its earlier architectural integrity. Amazingly, the plaster ceilings in the living room and dining room and the walls in the foyer, the stained glass window on the landing and most of the woodwork in the home appear to be original and unmolested by time or previous tenants. We feel that the Keatings would be proud of our restorations and indeed, the rich history of the house itself, poised for another century of grandly anchoring the corner at 12th Avenue and Pennsylvania Street.